I don’t want to come off as an instruction snob, but I sure miss color instructions that come as a booklet rather than black-and-white keep unfolding posters. The intake fan detail and leg covers are entirely optional. What could have made this a better packaging? 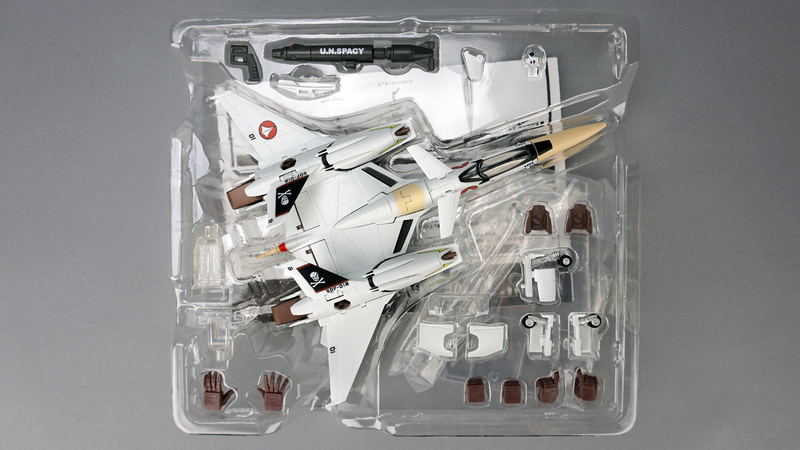 Other than a better box, I think this toy comes with what would be expected of it and more (like the gun pod and display stand). 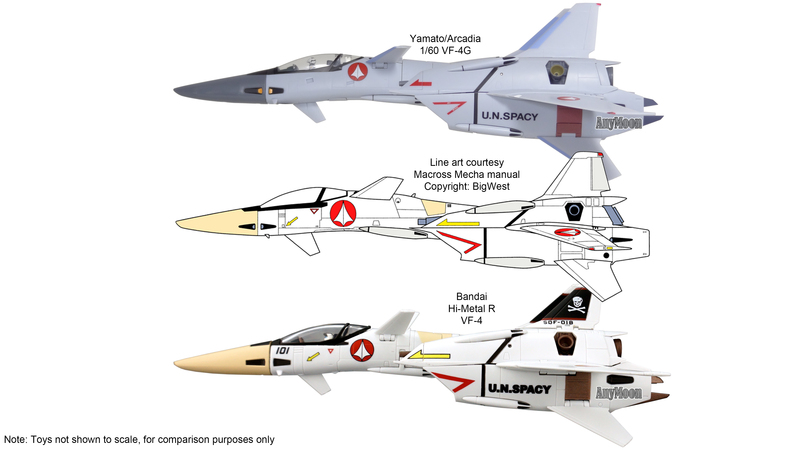 You may be aware that Yamato released (then reissued by Arcadia) a 1/60 scale VF-4G toy (a paint scheme from the VF-X video game) and established a high standard for nailing the look of fighter mode. This toy, much to its credit given its diminutive size, looks like the Yamato toy but with the DYRL paint scheme. There are some minor differences, the HMR toy lacks the notches in the nose that Yamato used to lock the chest together in battroid and adds heavier panel lines. The Yamato does have clear plastic inserts on the tail light and wings and a much better pilot but these are concessions you would expect in the HMR given the size. The HMR’s size also works against it when it comes to the seams where parts connect which look wider (the seam around the nose being the worst offender). The HMR does have more painted-on detail. 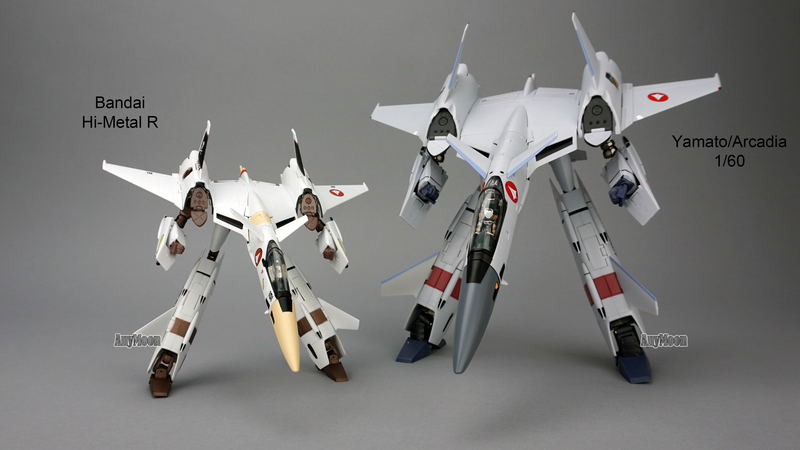 In comparing to the line art, both toys do fighter mode great justice with their only deviation being some thickness in the leg/shoulder’s fighter mode profile, clearly the line art benefits from a touch of anime magic. The HMR also has its wings protrude very straight from the body rather than a gentle downward sweep (you can simulate the sweep but exposes the wing’s hinge more so it’s not an optimal solution). GERWALK mode is what it should be. 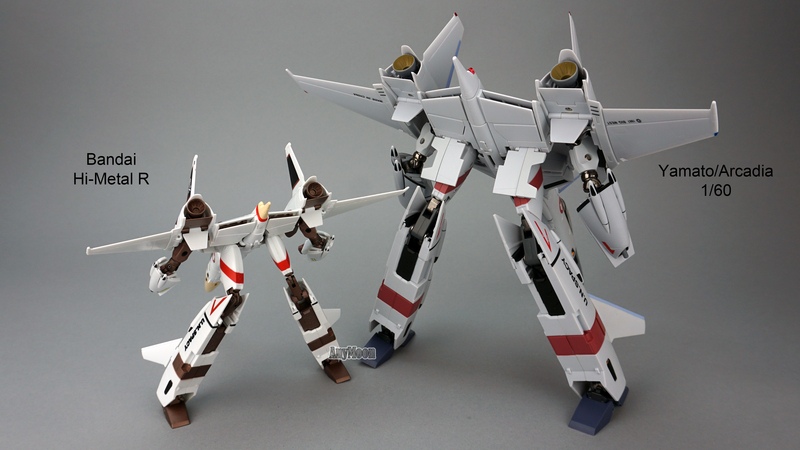 I found the ankles on this toy more forgiving than the Yamato/Arcadia toy allowing for a more aggressive slant of the legs. The arms also seem to be able to pivot just a tiny bit lower from their housing making them appear more functional in this mode than on the Yamato/Arcadia effort. Like all other HMR before this one, the integrated hands are tiny and you’ll most likely want to swap them out for the optional fixed posed hands as part of the transformation process. Battroid mode line art is impossibly chunky for the incredible sleek fighter mode that both Bandai and Yamato/Arcadia prioritized. As a result, neither toy captures the fat legs and huge shoulder pauldrons of the design. 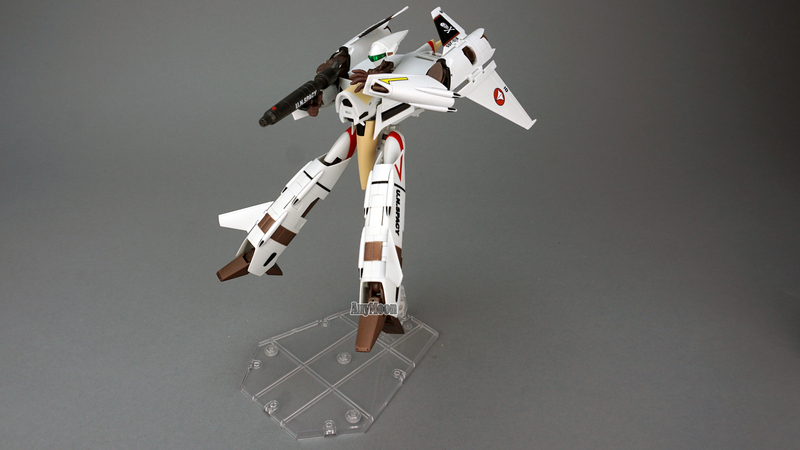 That said, a more slender battroid mode is much more in line with the aesthetic of modern variable fighters so the concessions for fighter mode will be seen by many as an improvement for battroid. So that may seem like a lengthy list of concessions but they’re very minor in the grand scheme of things because Bandai made one HUGE improvement over the Yamato; the conformal missiles actually stay securely in place. 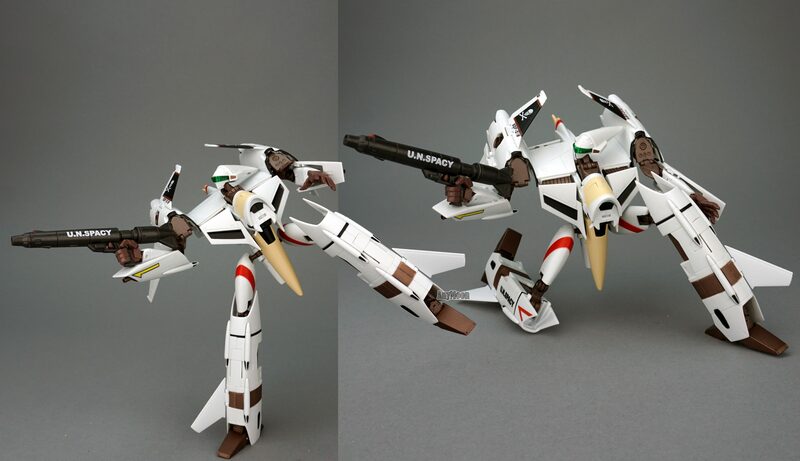 The Yamato was frustrating to handle with missiles popping off very frequently (especially during transformation) whereas I was able to transform my HMR when it was brand new, at its stiffest and requiring the most force, without a single missile falling off. That’s not to say this is a frustration-free toy. 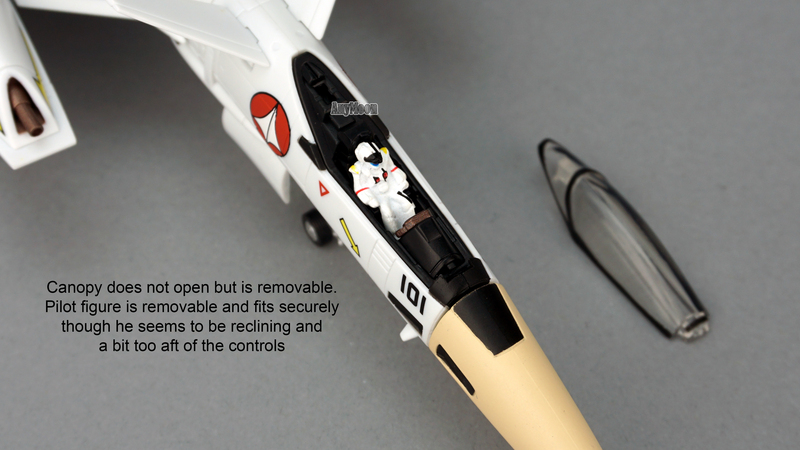 Like the Yamato, various adjustable bits don’t have ‘home’ positions they lock into. 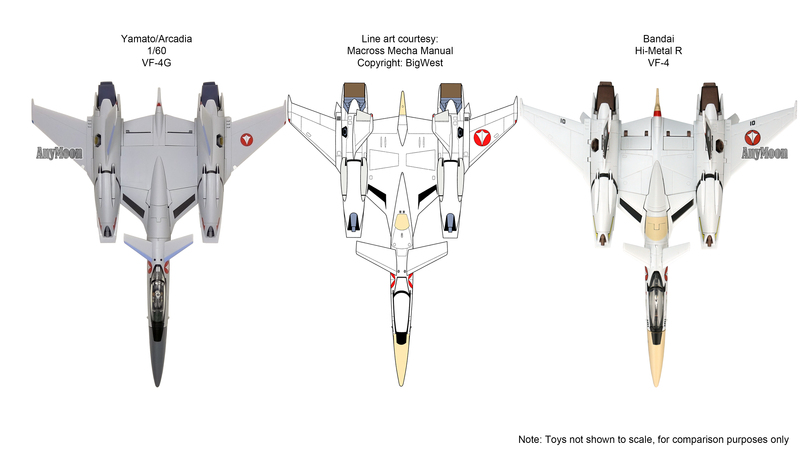 The vertical stabilizers, canards, and rear tail fins all pivot with a fair range of movement and none of them have a detent that tells you where they should be or keeps them in place. 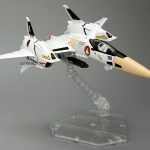 This can make it hard to get things symmetrical and easy to make the toy look quite jostled, particularly in fighter mode. There’s another issue that may bother some people relating to the landing gear. 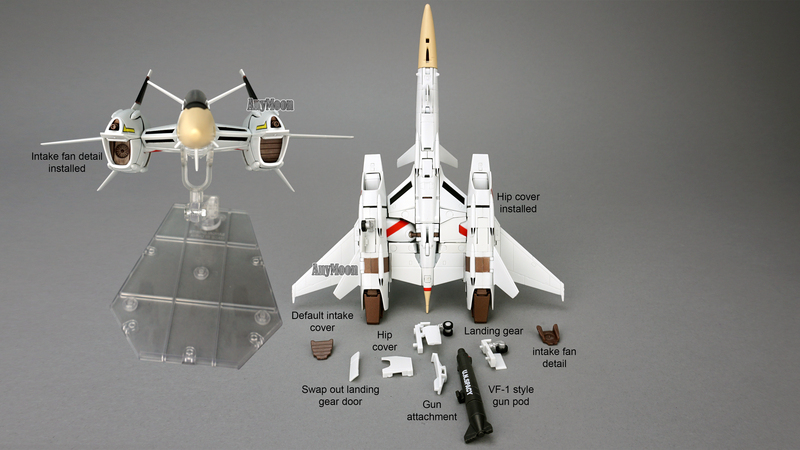 The toy holds the preponderance of its weight toward the rear of fighter mode so it will have a tendency to lift the nose. This is easily rectified by bringing the rear fins down to ground level to act as a brace. Of course, using this trick makes it appear there isn’t sufficient clearance but it didn’t really bother me. 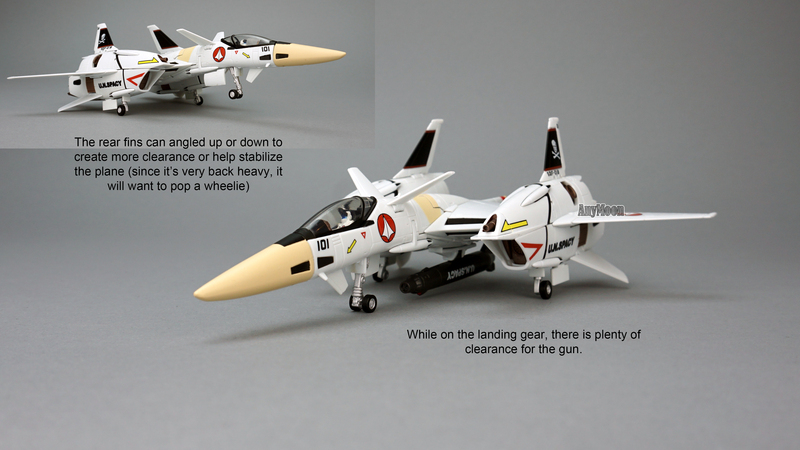 Other people may also take issue with the need to use a separate piece to connect the gun in fighter mode. Fortunately, the connection piece does a good job connecting to the toy and holding the gun so, though its existence may annoy some, at least it performs its job efficiently. If Bandai ever decides to make a DX toy, there is one improvement they should consider: the shoulder sits in the center of the large housing of the engines, if it were on a sliding mechanism it could come to the front of that housing and be in a more natural position and help the arms get in front of the massive chest hump in battroid mode and be more functional in GERWALK (and the line art seems to imply that’s where the shoulder belongs). 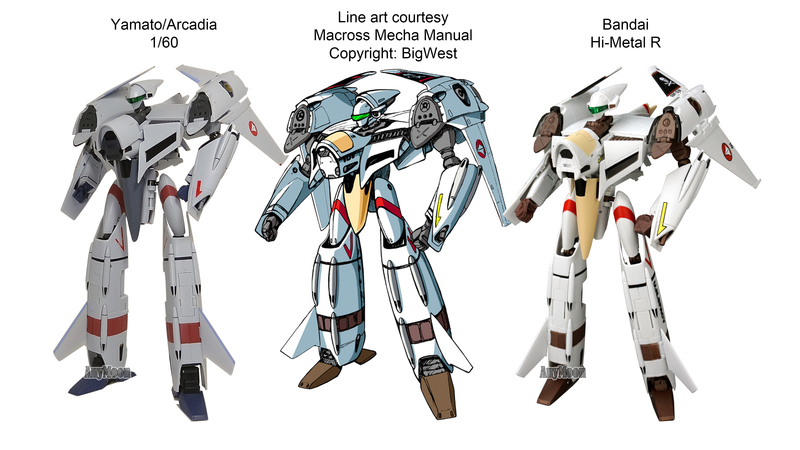 If Bandai really wanted to go nuts, they would incorporate that slider and the ability to tilt that big housing back to make battroid more dynamic. At this scale, these ideas don’t seem feasible and I was overall very happy with the effort. As noted, the missiles staying on is a huge relief as it reduces the risk of one getting lost. If you’re someone who insists on a lot of metal and heft, then you’re probably going to find this Hi-“Metal” offering rather “low metal”. 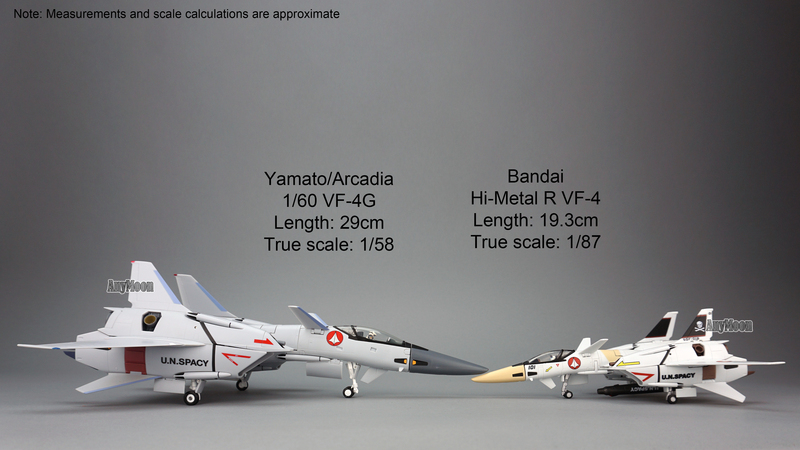 At 110 grams this thing is light, lighter than the 122 grams of an HMR VF-2SS, and far lighter than the rather hefty Yamato/Arcadia toy’s 382 grams. If you can get beyond the lack of heft you’ll find the toy is very sturdy with nice tight joints. Complaints about manufacturing issues seem to be average. 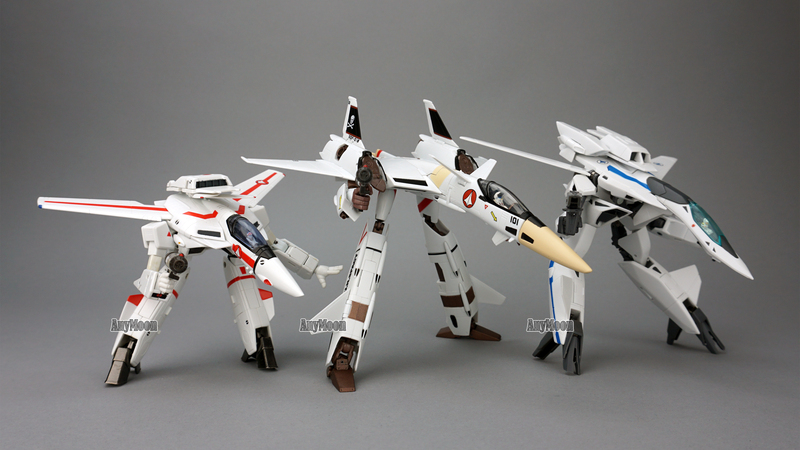 My only issue is that the vertical stabilizer above the left shoulder doesn’t extend upward which limits how far it can be pressed down in battroid mode, there seems to be some errant glue holding it in place. As more people get this toy in their hands, I’ll keep an eye out for reactions and reports of common failure points and update this section/score if a weak spot comes to light. 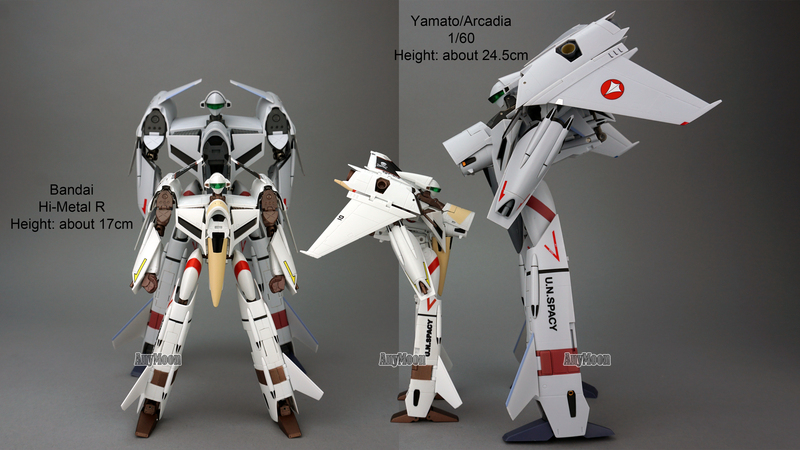 Basically, anything the Arcadia toy can do, this toy does as well… usually by employing the same mechanisms. 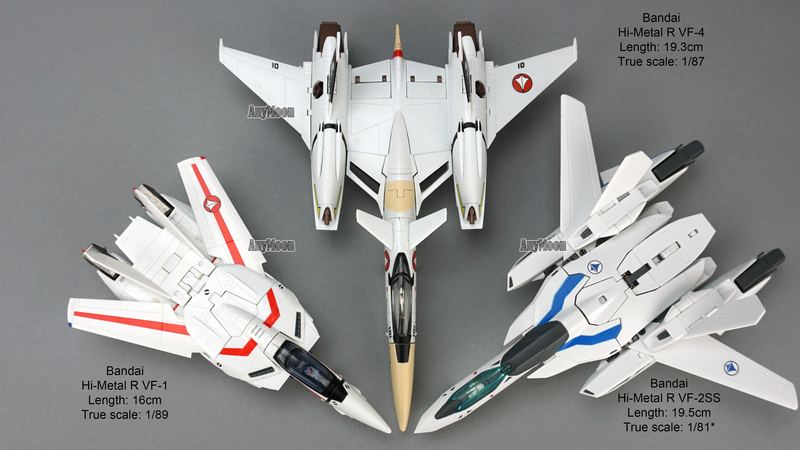 Both toys have an articulated nozzle above the feet in fighter mode. In battroid mode, there are two improvements to note. First, the head is on a ball joint which allows some fun cocked head poses, the Yamato toy’s head only swivels. Second, the arms pivot to a lower position at the shoulder giving them just a tiny bit more utility. 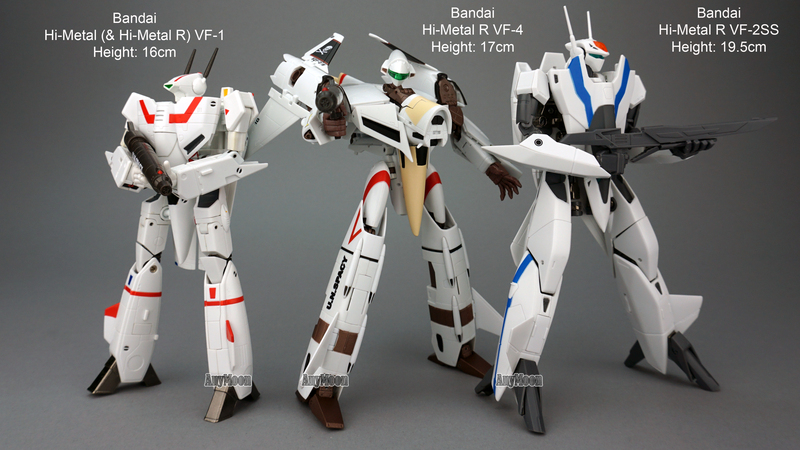 Otherwise, as is standard for the design, upper body articulation is hindered by the huge chest hump and shoulder housings. The shoulders are on a ball joint and the cover directly ahead of the shoulder pivots out of the way to give the shoulder a little more room to operate. There’s a swivel below the bicep and the elbows feature a double pivot allowing you to have the forearm guns above the wrist or below them while simultaneously offering a 90 degree natural upward bend (usually I hope for more than that but the arms are so inhibited on this design that more elbow articulation wouldn’t make a huge difference. There is no waist but the ball jointed hips have a huge range of motion and ability to tilt in and out and obtain very wide stances. The hips are on pivots that allow the legs to swing way back and point the toes entirely to the left/right making up for the lack of a swivel at any point in the leg. There’s no rotation point at the knee, but range of motion is well beyond what you would find on most transformable toys. The feet do a great job, again emulating the Yamato design, but with just the right fluidity to function much better than my Yamato toy does. 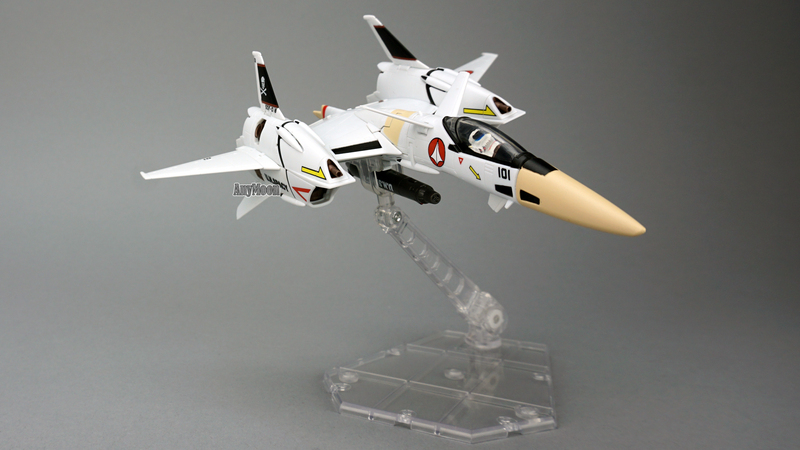 I’ve scored this toy higher than the Yamato toy. 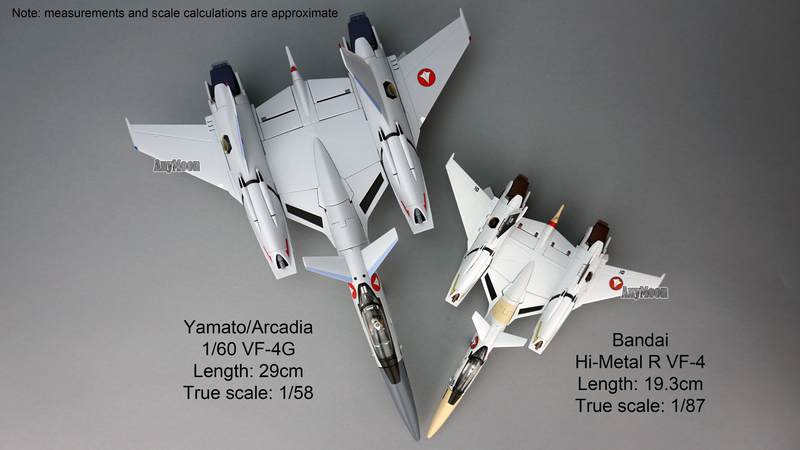 It’s true, the Yamato toy is more substantial in weight and size and has better design elements but it’s also not nearly as much fun to handle. The HMR is a lot of fun and it comes in a more complete package. The included display stand takes the sting out of not having integrated landing gear. 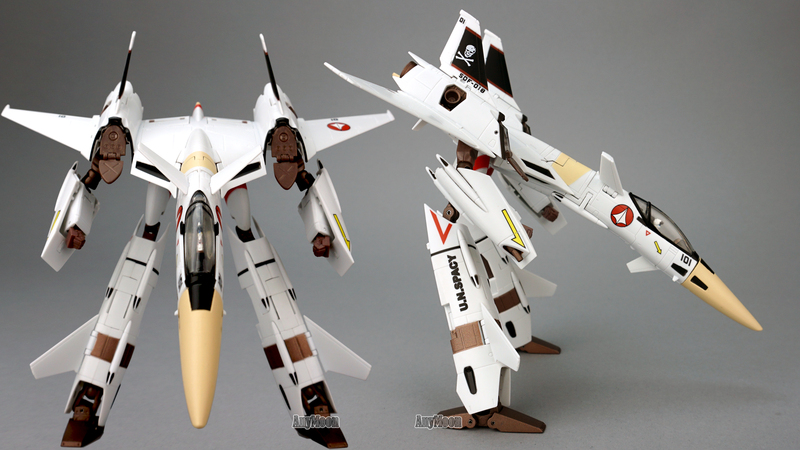 The separate leg covers for the bottom of fighter mode probably won’t be used by many whereas the integrated ones on the Yamato/Arcadia fall off frequently during transformation and in GERWALK mode and are prone to scratching (the inner portion is painted metal on that toy). The included gun adds to the fun in all modes. 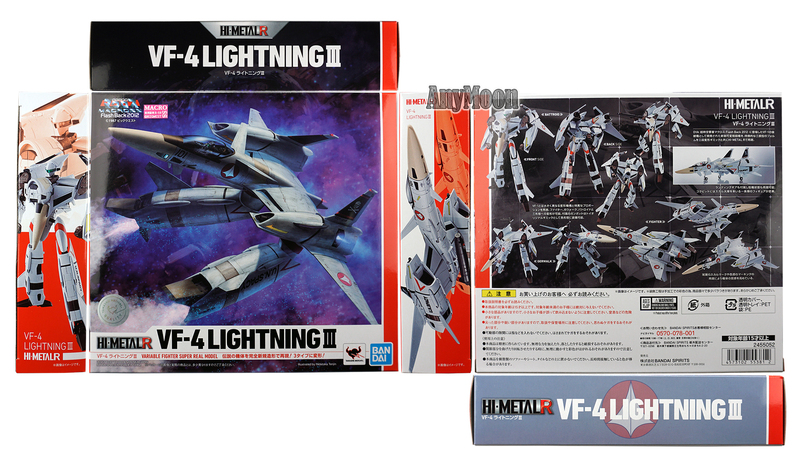 If you like the VF-4 design in any of the three modes, than I think this toy is worth owning.